This roundup features 10 uses for apple butter from appetizers, breakfast, entrees to desserts. There’s an apple butter recipe for any time of year! You may be thinking: 10 ways to use apple butter in March? It’s not really apple season, Gina. Yeah, I hear ya. It’s not really anything season in NY this time of year though (major eye roll) and while maybe an oddly timed post, I find condiments to be one of the few things that get me through this in between seasons time where everything feels gray, dreary and you start to lose hope that spring will ever actually arrive. As far as condiments go, apple butter definitely makes my top 5 list (along with honey mustard, ketchup, sriracha and Laughing Cow cheese <– don’t judge). So what better way to celebrate it than a post dedicated to the best recipes that use it? *This post is in partnership with Musselman’s. All content and opinions are my own. How is Apple Butter Different than Applesauce? The difference between applesauce and apple butter is actually quite simple. Apple butter is just cooked down longer. It becomes thick and glossy in appearance and the flavor is much more intense than applesauce. Applesauce tends to be eaten alone or used in baking whereas apple butter is often treated as more of a condiment. How Long Does Apple Butter Last? Apple butter will stay good after opening for about a year if kept refrigerated. Trust me, I know this because I had a 32 ounce jar of it for at least that long in my fridge last year before we used it all up and I never saw the beginnings of mold like you undoubtedly would with applesauce in that timeframe! Glad you asked! That’s what this post is for, to give you 10 uses for apple butter you might not have otherwise thought of. From a glaze to a condiment to an ice cream ingredient and cookie filling, there are so many fun ways to incorporate apple butter. It’s one of my faves partly because of its versatility. It can go either sweet or savory, be used simply as a spread (like on these paleo pumpkin english muffins) to enhance flavors or, as an integral part of a recipe. I think you’ll love these 10 apple butter centric recipes, enjoy! From appetizers to sandwiches to burgers, ice cream and cookies there are so many sweet and savory ways to use apple butter. Find one below! 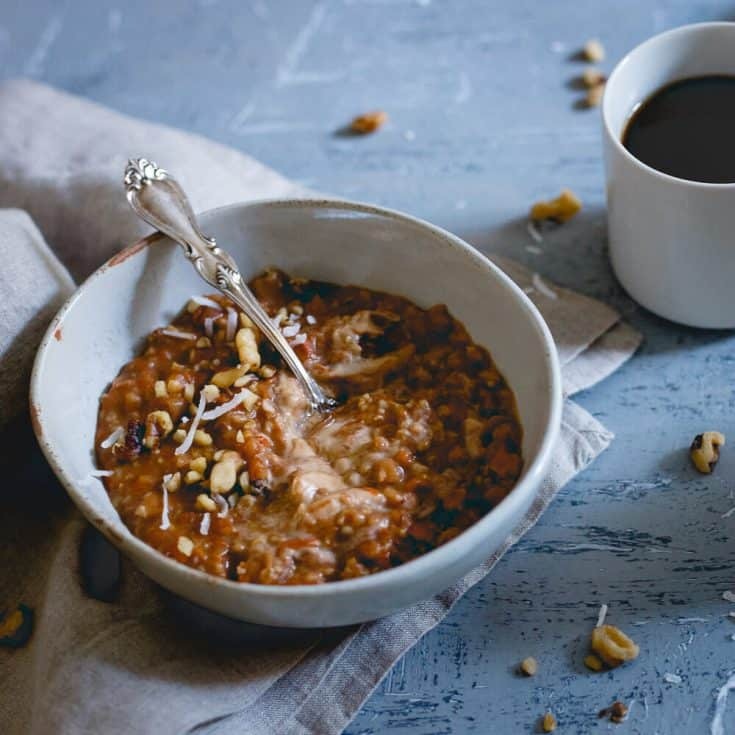 A super cozy breakfast that combines apples, apple butter and carrot cake flavor. 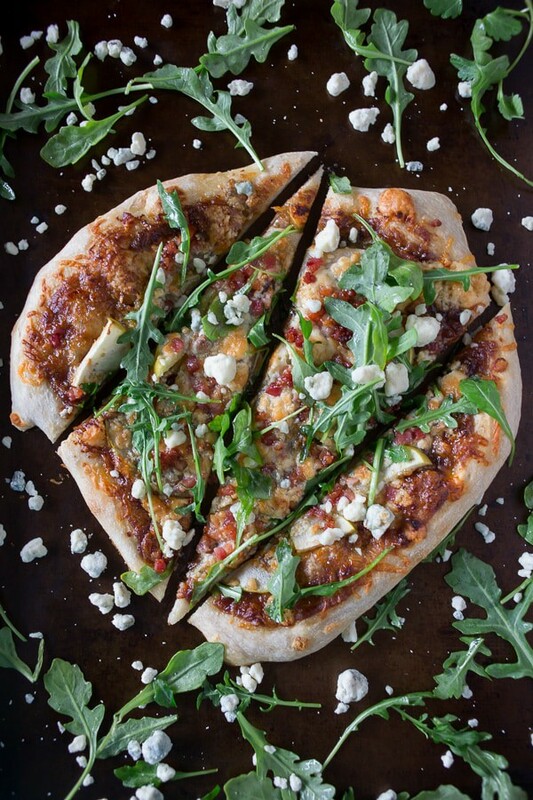 Sweet and savory combine in this perfect Sunday night dinner. 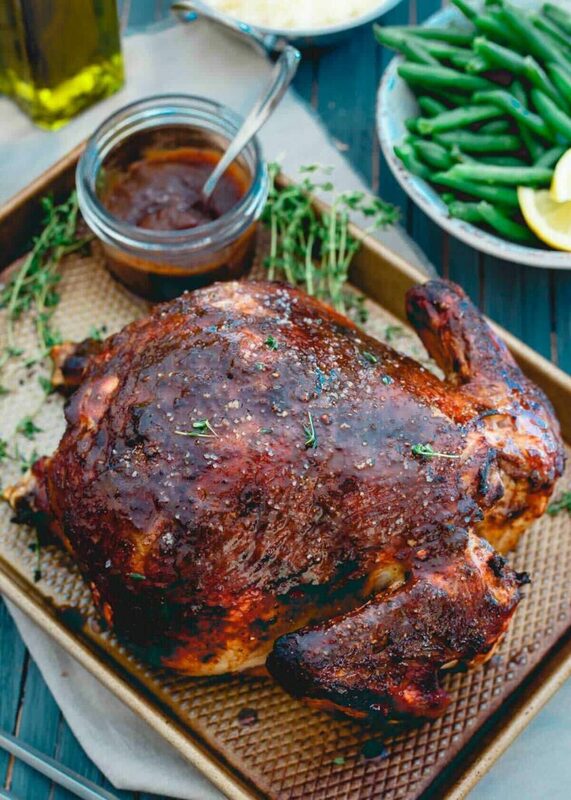 Slather your bird with apple butter for a delicious hearty meal! 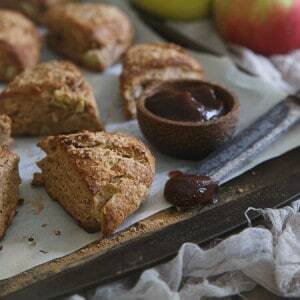 Sweet apple and salty bacon flavors combine in these rustic, hearty scones. Your breakfast needs one! 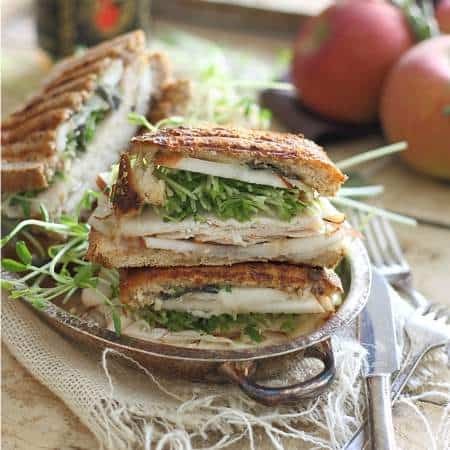 Use apple butter as spread on this fall-flavored sandwich with melted cheese, crisp apples and fresh turkey and herbs. 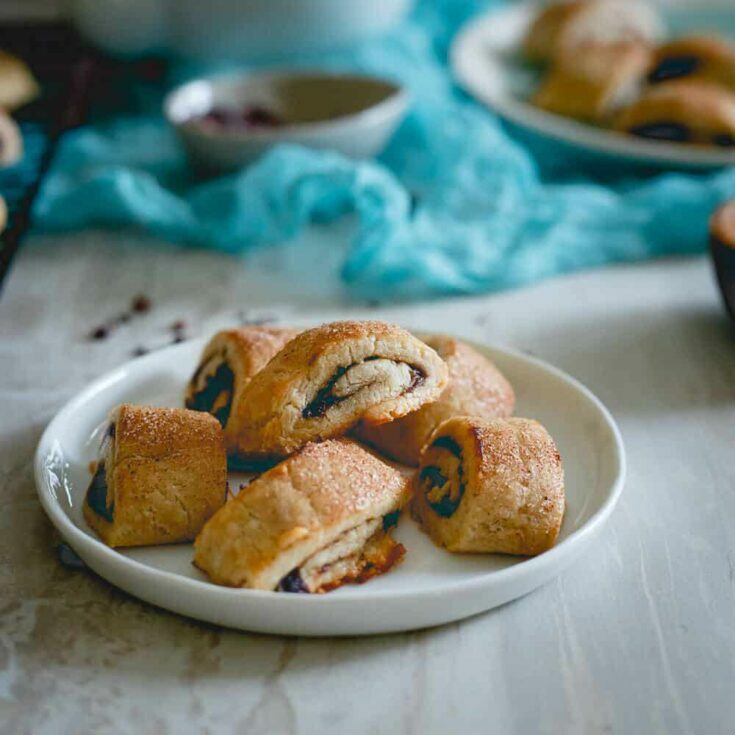 These rugelach are buttery, soft, sweet bites studded with cacao nibs and apple butter. An absolute treat! A pizza with apple butter - how fun! Ready in 30 minutes and lots of sweet + salty flavors going on. 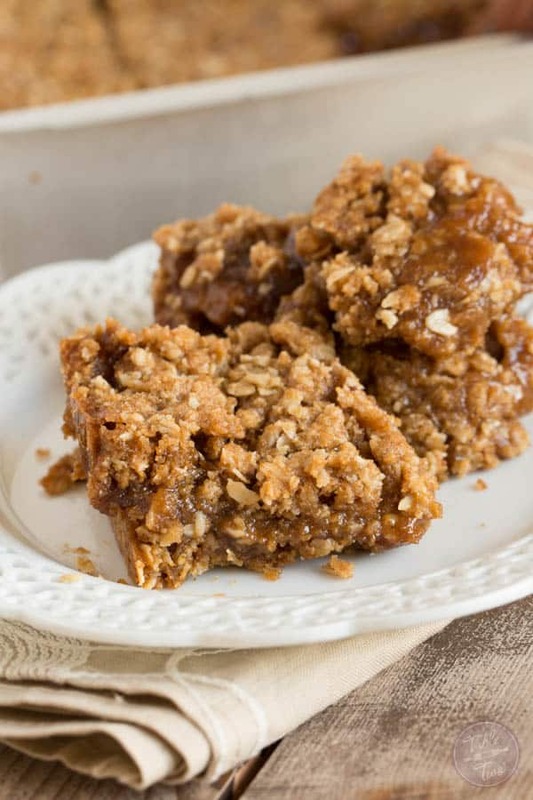 The ultimate fall dessert - sweet caramel bars laced with apple butter. Don't forget the vanilla ice cream on top! Creamy and homemade. 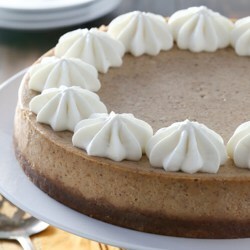 Can't beat a cheesecake with cinnamon and apples and a graham cracker crust. 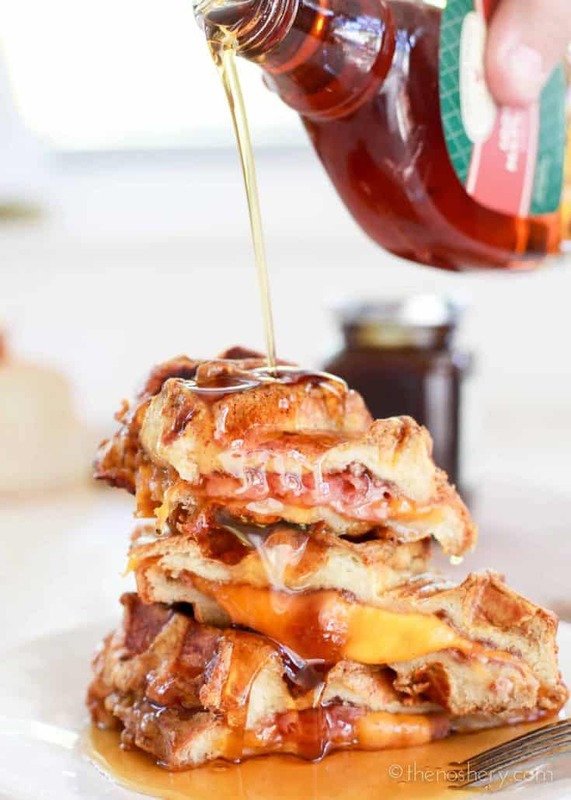 How could you not want this sweet and savory concoction for a weekend brunch?! An easy 1-pan recipe perfect for fall dinners. 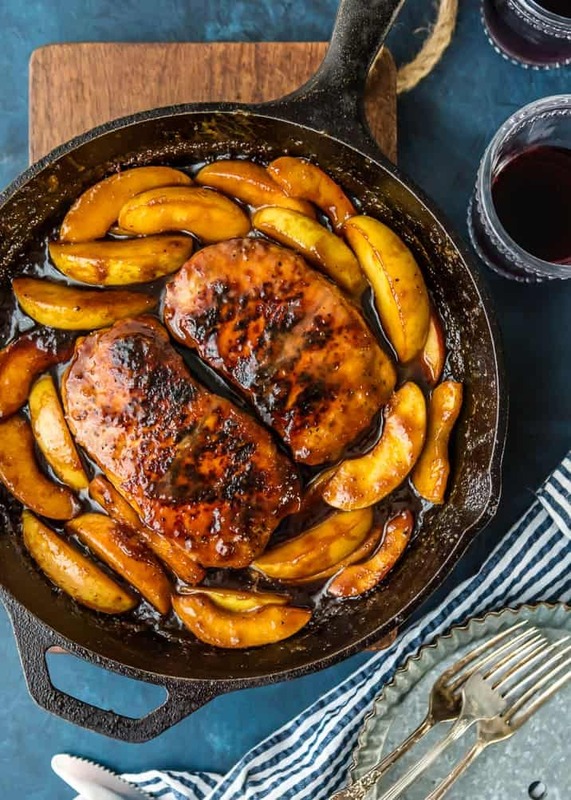 Juicy tender pork chops and sweet sauteed apples all made in the skillet! For even more apple butter recipes you can check out the Musselman’s apple butter ebooks! They all look absolutely delicious, but that burger is calling my name!!! Great post Gina! Such creative recipes for apple butter! Love those little sliders! I am always looking for new ways to use apple butter! Those wings look finger licking good! I will take one of each please! All of these ideas look so tasty! All awesome ideas, especially that burger! Those sliders look GOOD! 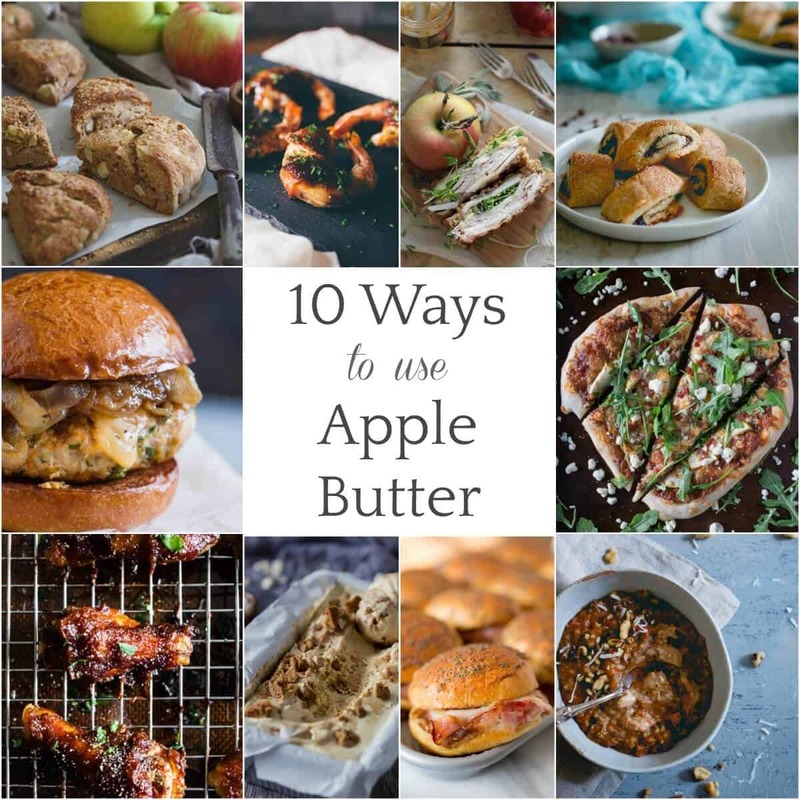 I don’t buy apple butter too often… some good ideas in here! Love all of these savory and sweet options! Those apple butter honey mustard wings look amazing! So many great ideas in this post! I want them ALL but that burger has my name all over it. We love apple butter!